Fight the enemy by spelling words correctly. The app is not only about spelling, it also teaches children each word definition, etymology and the right pronunciation by using recorded audio files (headphones might be useful). Spelling Hero Game includes difficult words and can be used by teachers in English lessons and spelling competitions. Parents need to know that the Spelling Hero Game App is suitable for children aged 8 to 14 and helps children practice spelling by providing key definitions and correct pronunciation in a fun and exciting spelling game. The app is well designed and easy to navigate and once shown to your child they will be able to progress with the app unsupervised. The parent can sign the child in as a user, where scores are kept or as a guest user. When creating a user profile, it is noted that the options require an email and the age option seems rather restricted along with the Grade system. Giving the parent an option of age 13 or less does not really give a target indication of how old the child might be. We do like the Gender option as this tailors the super hero to a boy or girl. The app has ten levels to complete with each level fighting a different enemy. The power bars at the top indicate when the enemy is defeated or where your super hero looses strength if you answer incorrectly. The graphics are fun and entertaining and have a real comic book feel to them. The game has a few on screen buttons such as turning the music off, a pause options, a listen again options, a hint button and a back option. The app needs to be played with sound and is ideal with headphones. Once the word has been said a definition is included. The child must move the letters in the correct sequence to spell the word. We did find that the drag-and-drop or tap feature of the letters was a little unpredictable at times. If the word is correct then the super hero will fire at his enemy automatically. If the word is wrong and submitted, then the enemy will fire at you. Several wrong answers and you will be beaten. The words do get progressively harder although we did find that app sometimes had no reasoning for the spelling difficulty as some words were incredibly hard including 8 letters and some words very easy including only 4 letters. Even though Spelling hero is great fun the app is very repetitive and we were waiting for a grand finale or a change of tact in the app that didn’t happen. Each correctly spelt word shows the same attack, regardless of how difficult the word was. We think that spelling harder words should display a better looking attack, rather than the same one used to spell an easy word from level one. As a parent we would also like to see the option of adding our own list of words words that can be used in the battle. Spelling hero is a great game to help with your child’s spelling however we would like to see more options to help increase the user engagement. 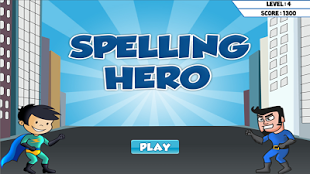 Spelling Heroes Game - gamifies the process of learning to spell. This game acts as a workbook for Spelling Hero - the most complete spelling list to practice for school bees, regional bees, and for anyone aspiring to the highest ranks of the National Spelling Bee. If you are sceptical about studying with anything other than the dictionary, we recommend that you use our Spelling Hero Game to start improving your word bank for the upcoming National Spelling Bee! With Spelling Hero Game, a solid word foundation is at your fingertips. Our word lists are constantly updated and are comprehensive and suitable for most spelling bees - including National Spelling Bee, North South Foundation Spelling Competition, UIL Spelling Competition, various school bees, county bees, regional bees, and hometown spelling competitions. The Spelling Hero word list includes challenging words from Paideia, the Consolidated Word List (CWL), and regional and national bees since the 1970s while the bulk of the more difficult words include Scripps' Consolidated Word List (CWL) with all the words including their pronunciations, definitions, and etymology! Over 1,000 words sorted by difficulty level.